TOPERSUN is a famous brand in China and liked by many young people. Our company is approved by US.FDA and sell products all over the world. You can buy our glasses from USA, UK, Australia, Canada, Mexico, Spain, German, Japan. For the model DGYKGS-001 Semi frame 33% blocking blue light glasses, It can be used in working, reading E-book, playing games, protecting eyes after eye surgery. The glasses details index as below. Glass matetial: metal part is good nickle silver, Plastic part is good Nylon and CP. Lens is good PC. 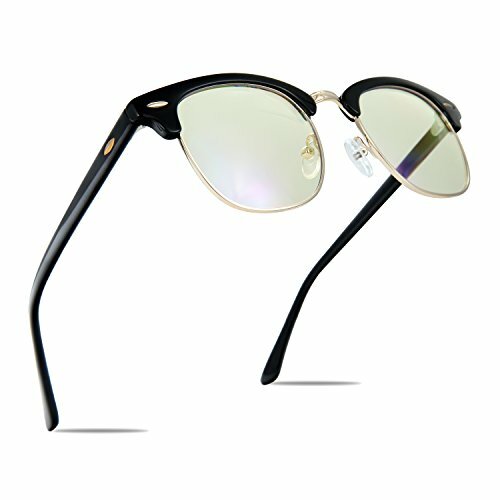 Glass size: Lens width 43mm, Bridge(DBL) 22mm, temple/arm length 140mm. Warranty: 2 years warranty. If you receive any defective product. We will resend you a new pair one or refund you money. Your satisfaction is our lasting goal. If you like our products, give us a 5 stars review will be much appreciated. 2.The blue light gaming glass shall be wear in indoor place.Its function is different from sunglasses, can not see sun directly. We do not suggest you to use it outdoor as shades. 3.There are small parts in the eyeglass(like screw, nose pad), so please keep the eyeglass away from child 0-3 years old to prevent potential danger. 4. Do not use detergent to clean lens, you shall use our clean cloth to clear when lens with finger print or dirty. If you have any questions about this product by TOPERSUN, contact us by completing and submitting the form below. If you are looking for a specif part number, please include it with your message.